Background: The presence of lignin in rice straw, an abundant biomass acts as a barrier preventing the enzyme accessibility to cellulose and hemicellulose for hydrolysis and fermentation to ethanol. This makes biomass pretreatment an integral step which can broadly be classified into physical, chemical, and biological pretreatments. While physical and chemical pretreatments involve high cost inputs and produce fermentation inhibitors thus polluting environment, biological pretreatment is accomplished at low temperature and pressure without using expensive equipments and chemical agents. Biological pretreatment using ligninolytic white rot fungi involves a synergistic action of laccase (Lac), lignin peroxidase (LiP), manganese peroxidase (MnP) and versatile peroxidase (VP) and adjunct enzymes such as H2O2-producing oxidase. Method: The present review has been compiled by searching current physico-chemical and biological strategies for pretreatment of lignocellulosic biomass particularly rice straw across the scientific world. Results: The review summarizes the current status of physical and chemical processes such as autohydrolysis, irradiations, acids, alkali and oxidizing agents and highlights the biological pretreatment alone or in combination with other pretreatment processes. 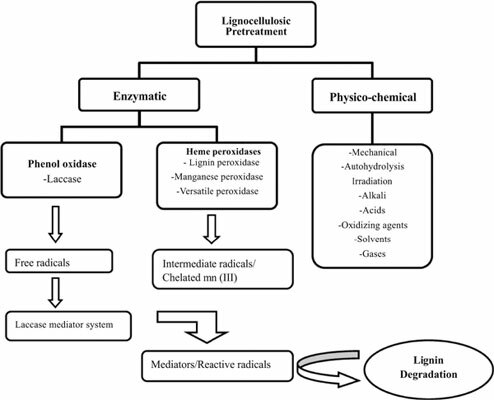 The specific topics discussed under the biological pretreatment process are: lignin degrading microorganisms (particularly fungi), major classes of rot-fungi and their modes of action, ligninolytic enzyme families, their detailed structure at the molecular levels, biochemical properties and their modes of function. Conclusion: The findings of the review highlight the advantages of biological pretreatment using white-rot fungi for the pretreatment of rice straw as an environment friendly and inexpensive approach over the currently practised physical and chemical processes of pretreatment. Lignocelluloses, rice straw, pretreatment processes, biological pretreatment, rot-fungi, ligninolytic enzymes, phenol oxidases, heme-peroxidases.